How many calories in Green Peas? See below, the Green Peas calories for the different serving sizes. We provide you with Green Peas nutrition facts and the health benefits of Green Peas to help you lose weight and eat a healthy diet. 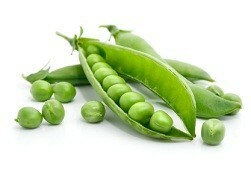 Green Peas are generally purchased either frozen or fresh in their pods. Peas are low in fat, but provide a very good source of protein and fiber. As you would expect, they are full of vitamins and minerals providing a good source of vitamin A, vitamins B1-B3, vitamin B6, folic acid, vitamin C, vitamin K, iron, manganese, phosphorus, zinc and many more. Peas contain many phytonutrients. In research, consumption of Peas have been shown to lower the risk of type 2 diabetes, stomach cancer and have anti-inflammatory benefits. Other Peas benefits include regulating the digestion of food given their high fiber and protein content. Below we have three calorie tables, comparing the calorie content when raw and when boiled. We've also included split peas. In addition we have a nutrition table showing in detail the nutrients, raw versus boiled. Compare the nutrition and calories in Green Peas with the calories in other vegetable varieties. This soup recipe only takes 20 min to prepare if you use cooked chicken and just over an hour if cooking with raw chicken. The recipe is diabetic appropriate, promotes healthy heart and weight. It is low in calories (133 kcal), carbs (5g of net carbs), low in cholesterol and sodium.